The way to the top model ? The range is 10-12" but not to exceed 12" (30.5 cm). 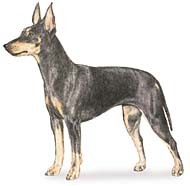 The single layer coat is sleek, black and tan markings. The Toy Manchester Terrier is lively and attentive, true to the terrier personality. and so does better as a family dog with someone around, than as a kennel dog.